We want to save you time while you're on the road, which is why we have built-in voice dictation! 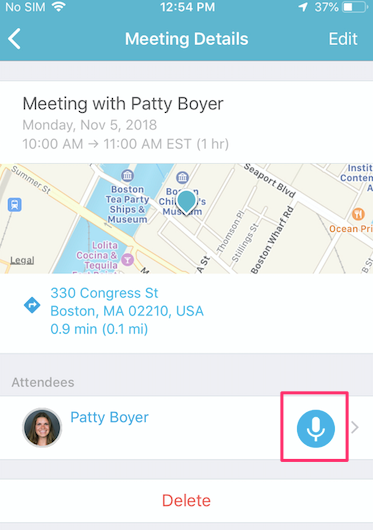 In the My Trips section of the EverTrue Advancement mobile app, you will find a blue and white microphone icon next to a constituent's name (outlined below). Once you click the microphone icon, it will immediately begin recording. To finish, you'll see a blue stop button (square icon inside blue circle). Here's an example. While the Microphone icon will appear in the My Trips interaction, it does not appear in the standard interactions write form (if your school is writing interactions in EverTrue). You can still use the Dictation button that is native to the iPhone keyboard. This button is the microphone icon directly to the left of your space bar. Check it out below. Please note that Apple does place limits on the number of Dictation "calls" a user can perform - this limit is 1000 calls in an hour, with each call being a maximum of 1 minute in length (from start of dictation to end) - if you begin to dictate and press the stop button, this is considered a call. To get the best accuracy from dictation, make sure to speak clearly and don't speak too quickly!